The first real sweater for myself, now there is a concept. 2008 is looking to be a ‘selfish’ year when it comes to knitting since I have resolved to stashbust and most of the yarn is for projects for myself. Also have some small projects for others in there, but not too many. Can’t say I’m overly saddened by the idea. Up until this point, most of the projects I’ve done have been for others, and I avoided knitting myself sweaters because I had this stubborn idea that someday I will realize the Fantasy of Being Thin and why waste the yarn? But not anymore. I can make them with little to no ease now and they’ll still fit if it happens. Problem solved. Anywho! The CPH is going very well. Not quite as fast as I would have liked since I had to rip back several times on this project. Unusual for me as I’m usually stubborn and insist I can make it work. But I am very happy overall with the results. 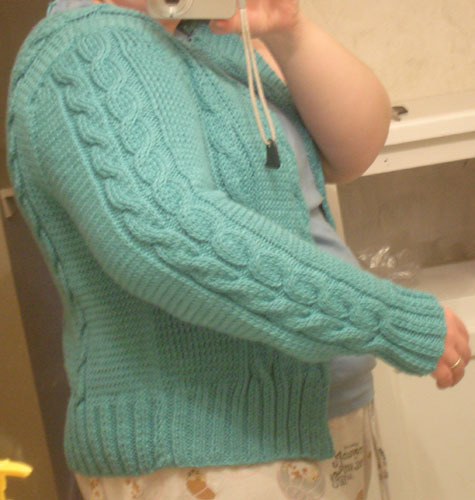 Been taking notes on what I’ll change when I do this sweater or one like it again in a winter-appropriate fiber. (Current one is being made in KnitPicks Shine Worsted-a cotton/modal blend. Very soft but not the warmest. Has lovely stitch definition as can be seen in the pictures.) I’m considering lining this one as well since I dislike being able to see the wrong side of the sweater and it would give it just a little more chill protection. -Knit body as one piece instead of three. Seaming turned out well but it was difficult to make all three pieces exactly the same length and the exact same gauge. Also, do not bind off shoulder tops and graft or 3 needle bind off instead of seaming. I think it would look neater that way. -Knit with an easier to block fiber to ease with any seaming that may remain. Shine worsted did not block at all making things a bit tricky at times. Those things may seem sort of big, but in reality, they’re pretty small points and issues. Sweater is almost finished, but probably won’t be before another trip home. Should have the second sleeve finished and seamed tonight and may be able to start on the hood. First priority while home is making a Minimalist Cardigan for my mother. Can’t wait to start that one, the yarn is lovely and I’m excited to do a new stitch. My projects for others seem to turn out better then ones for myself and I think I could use a break for a week or two. So here is the first–and long overdue–post of 2008. I’m pretty excited to see what this year brings.